Let's say you want to add PE codesiging to your instance of BDF after you patch PE files. It's really easy. But to be honest, it's something I will not officially support in BDF for various reasons at the moment. One of them - I don't want to ship signing certs with BDF. Perhaps I'll release a pro version where I implement everything or I'll teach a class and include stuff like this. Or I'll just tell you below. Why would you want code signing in BDF? Internet browsers, like IE/edge, give a pass if the binary is signed (A/V is a another story). So if a signed binary is delivered via http, MITM'ed, unsigned, patched, the re-signed with a valid cert - a browser like IE should be ok with it. Since BDF is part of BDFProxy, then even better right? Cool, ready to add code signing to BDF? 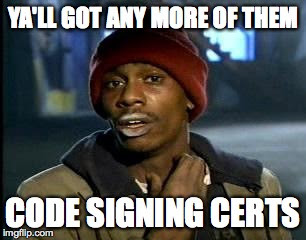 First things first, you need some signing certs. The kind folks at Duo Security did some great research, read it here. Now BDF runs great on *nix/OSX, so we need something that does PE code signing on linux. Next we need the signing certs and we need to put them in the BDF directory. Navigate to your BDF home directory. Let's use the verisign cert. We'll need to convert the pfx format to cer/pem as that is what osslsigncode prefers. Now we need to make a private key. Time to modify BDF source code!! Open pebin.py in your favorite editor. Navigate to the bottom of the "def patch_pe(self):" function. \_ _____/____ _____/ |_ ___________ ___.__. This can be done with any PE code signing cert that is released leaked to the public. Get creative! If you think this should be part of BDF, let me know on twitter or github. Health Is God is the main finish wellbeing and health site that you may portray as it yours. We made a site that presents the accumulation of wellbeing and way of life data bolstered by solid substance suppliers and certifiable client surveys. This is a true exertion on our part to deliver a client encounter which is drawing in, moving, and intuitive. Health Is God expects to convey the most ideal wellbeing surveys of the supplement accumulations and different wellbeing generation that range from skincare to mind, muscle, male upgrade and cerebrum wellbeing conditions. You, the client are of most extreme significance to us, and we are focused on being the entrance that maintains your sound way of life. We are the most reputed and reliable Islamabad Escorts Service Agency We will arrange an incredible date for you They are Most pretty and broad-minded you can truly make all your desires come true with our Escorts in Islamabad service offering cheap and VIP girl in at affordable Price they fulfil your wishes and provide you great services Call us for booking. Supplements For Fitness consumers who buy their products. The FDA mentions five business associations with which they interact and dietary supplement companies must investigate joining them. They are the Council for Responsible Nutrition, the Natural Products Association, the United Natural Products Alliance (UNPA), the Consumer Health .